Banner Elk is the hub of the ski industry in North Carolina where each winter, tens of thousands of ski enthusiasts from the Southeastern United States flock to the High Country to take advantage of the natural and manmade snow and sub freezing temperatures on our area slopes. The ski season usually starts around Thanksgiving and runs through late March and provides an almost perfect venue for skiing as well as snowboarding at the resorts around Banner Elk. There are three main resorts in the area. 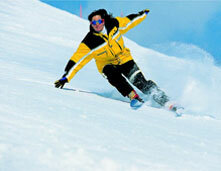 Sugar Mountain Ski Resort is located in the Village of Sugar Mountain and is the largest ski area in the state. The resort caters to more than just skiers as they also offer a great snowboarding park which is dedicated to snowboarders, and skiers are not allowed. They offer a 700 foot tubing park which is great for the whole family and the views from the top of Sugar Mountain are spectacular. Ski Beech Resort is located high above Banner Elk and is the highest ski resort in the Eastern United States. From its peak of 5,506 feet above sea level you will enjoy views of the mountains in South Carolina, Tennessee, Kentucky, Virginia and West Virginia. Ski Beech boasts an average snowfall of over 80 inches each year and is a 'must visit' for anyone traveling to the High Country. Our properties for sale and gorgeous Banner Elk Homes are located nearby to all of these great resorts and all of the excellent things to do in the High Country. If you are looking to buy an NC mountain cabin to invest in or perhaps an NC mountain vacation home, then take a look at our listings. We sell gorgeous Banner Elk Real Estate and Linville real estate and can help you with all of your needs for Western North Carolina real estate. Let us help you today.